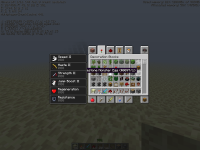 Item Description is rendered behind Potion Effect Status in Inventory (see screenshot). 1. Give yourself some potion effects. 2. Turn on detailed item description (F3+H). 3. Open creative inventory and hover over the "Cobblestone Monster Egg".